This entry was posted in Struggle and tagged accountability, action, actions, annoy, bible, Christ, christian, detail, encourage, fellowship, following, frustration, fuse, grace, holiness, humbleness, humorous, instruction, Luke 1, Luke 18, mercy, past, pride, read, refuse, resources, rest, scripture, seeing, spiritual, struggle, victory, vision, words, work by admin. Bookmark the permalink. Sometimes, we (or least I) tend to display a bit of false humility. I think this is especially true for us introverts. I may appear humble on the outside, but thankfully no one is privy to some of my thoughts! We often think that there is no one better to handle a task than us, or that since we are more reflective of life, that somehow we are on a different level than others. This is a mindset that I regularly have to guard against. Thankfully, God offers me many doses of humility throughout each week. False humility was a topic I started to include in the post and realized I just didn't have the time and space to cover it in the post. Maybe another time, but it definitely was on my mind as I studied this. I think it may even be more deceptive than the outright pride we often identify. It's hidden, and it involves not being honest with ourselves let alone others. Pride, in whatever form is definitely something we have to continually work at to both be aware of and to get rid of. Good point, Chris. Sarcasm duly noted (and assumed, actually). If you click on the link in #5 and read through the list, you'll see humility there too 🙂 I am sort of pouncing on your well-made point because sarcasm is, um, well, uh, has been, an issue for me. Pride just loves to poke its ugly head in each of us doesn't it. Just about the moment I think I'm doing well, something happens to remind me that I am and will continue to be a work in progress. I love the C.S. Lewis quote. Good stuff Kari! That it does, my friend. If you haven't read the entire essay 'The Great Sin" in Mere Christianity by C.S. Lewis, I highly recommend it. A few years ago God began revealing to me areas I was extremely prideful. I had not clue! I was so blinded by my pride that I couldn't even recognize it in myself (much like Sheldon). Satan does a wonderful job at helping us justify our actions/behaviors/emotions. I'm so thankful God took those blinder off…is still taking them off. Because like you said, it's not a "one time thing". Looking forward to reading more on pride. Thanks, Kari. Well done. Thanks, TC. For me, it's focusing too much on others and how my pride just isn't as bad as theirs. If I look at it that way, I've got nothing to work on, especially when mine is in one area and theirs is a lifestyle issue. See what comparisons do? Pray for me on this, please. I am teaching on this very topic at church tonight. I just prayed for you, Kari! Comparisons are very dangerous…so easy to find the justification we are looking for when we use comparisons. Appreciate the prayers! Comparisons are extremely dangerous, and I think they are something we have to constantly struggle with because if we're not struggling, we're likely giving in. I don't think there's complete victory over them this side of Heaven. We all have temptations of various kinds and those won't end till heaven. I think it's why Christ admonished His disciples to "Watch and pray…" our flesh is so weak! “Watch and pray…” diligence and persistence are so important in our faith walk. Great post Kari! Pride is that subtle, yet deadly, sin that rises its ugliness at me all the time. It is constant battle to put it to death. But it's a most important battle… and thankfully, Jesus helps us with it. Thanks, Dave. Pride is subtle until it glares at us and then seems insurmountable. It\’s a lifelong struggle and process for sure. A focus on Jesus is, in fact, the only way to defeat pride. Great post, Kari. For the last two mornings I've been spending time in Romans 1, I think it is, the verse about how they did not honor Him as God or give thanks and so He gave them over to their lusts. I've been thinking about what does it mean to honor God as God and in what areas do I not do that? One of the things God is impressing on me is that part of honoring God as God is to recognize that He's in control, not me and He gets to call the shots, not me. I can't stand on rights or what's fair. He is God! And being thankful is what helps me recognize that and be grateful for it and not mind when it seems like things aren't fair in my mind. 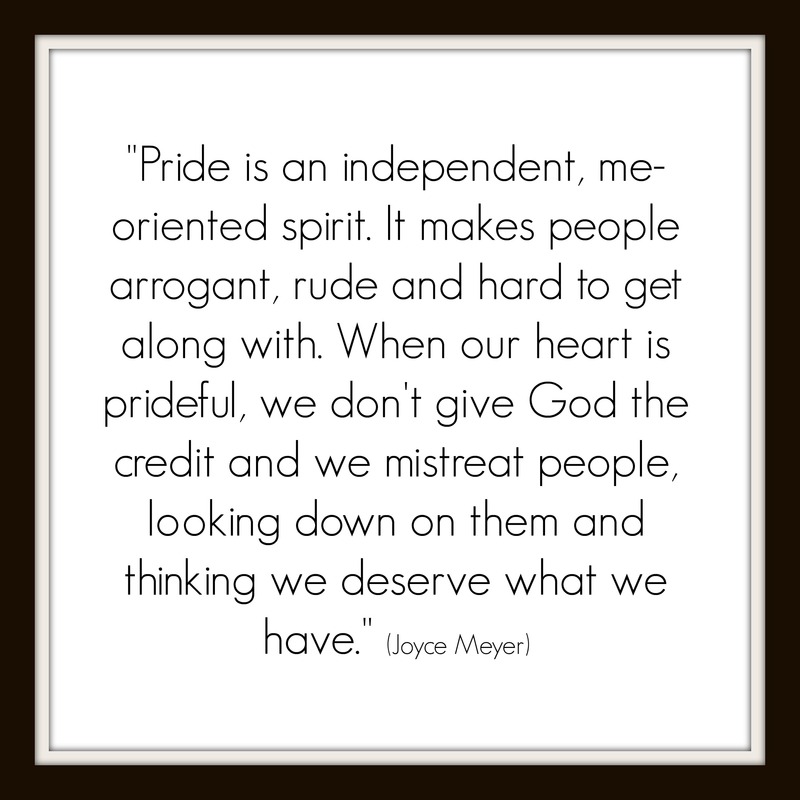 I loved your insights on pride and noticed you spoke about it at church – how did that go? Great insights from Romans, Barb. The need/desire to control definitely gets us hung up in the area of pride. The teaching went well Wednesday night, or so I'm told. I'm pretty hard on myself after I teach for some reason. Thanks for asking! For me, it's Satan attacking an area where he knows I lack confidence. I am still very hard on myself with writing though, too. What others think of me is still just too important at times, but that is impacted by a lot of factors too. I think for me it's fear of rejection and not living up to people's expectations. But for some reason I don't worry about that with teaching – maybe because I'm just enjoying people when I'm teaching. Interesting, Barb. We are all definitely wired a bit differently. Were can learn from each other too. I know I am one who displays being proud. I know I must guard against this for I fall easily into it;s trap. Seems like admitting that is half the battle, don't you think? I wish I could say I don't struggle with pride at times but ….well we all know the ending of that well. One thing I have learned though the years is when someone gives me a compliment to just say thank you even though I might be thinking in my head, that was a poor teaching time. The pride pit I get trapped in usually is the one when I want to argue my rights, or an opinion. I don't like having to admit I was wrong about something…like having others come to me for answers. So very thankful for sweet conviction that comes from Him. It's sweet for He always pulls me out of the pit and uses me again despite my foolish pride. Good post Kari…as always you have a way getting to the core of an issue. My recent post Fifty years and counting. None of us like to be wrong, that's for sure. My pride flares up in those instances too, even if I'm obviously wrong. I too am thankful for the gentleness of His Holy Spirit working in my life. Thanks, Betty. Your comment reflects what likely most of us experience. Pride is an all-too-common human condition, that's for certain. I haven't read "The Great Sin" by C.S. Lewis, but it sounds like a good read. It's interesting to read the passages of Scripture where God reveals himself to someone because that seems to immediately peel away any pride that might have been lingering in the heart. It definitely is, Caleb. Pride seems to block one\’s access to God. As we focus on Him instead of ourselves, pride breaks down, and we experience more of Him. You may want to check out "Humility" by CJ Mahaney – a great resource on the subject. Pride is a difficult sin to nail down. I wouldn't necessarily say that pride is about being better than the next person. That is certainly a manifestation of pride but it's not the sole definition. After all, Adam and Eve sinned because of pride when they were the only two people in existence. I would totally concur though with pride being anti-God. That's the essence of it – we want to be above God instead of the other way around. The difficulty is that pride is the core of our sin nature. It's not nearly as simple as battling something like gossip or alcoholism. Those are very specific. Pride is so general, it manifests itself in so many ways, and it's so part and parcel of who we are as sinners. I think the approach we have to take is not thinking that we can defeat pride, but hoping to subdue pride in increasing amounts day by day through the Spirit. Thanks for the resource, Loren. Pride is definitely difficult to nail down. You're right, it's not necessarily about being better than someone else, but it can be about that. Adam and Eve sinned because of pride thinking there was a better way than what God told them, and that's another way pride shows itself. Pride is definitely at the core of our sin nature, which is why C.S. Lewis's description of it fits so well. No, we can't fully defeat pride this side of Heaven, but I do believe it decreases the more we focus on humility (that's next week's post, btw). And we absolutely need the Spirit's help.